The forthcoming Survival expansion for Ubisoft’s huge third-person open-world shooter The Division will turn the game into a treacherous multiplayer survival game in which hunger, heat and thirst are as deadly as any enemies roaming the game’s virtual New York City. The game’s developers explained the ambitious mode during a surprise livestream on Monday morning—and they announced that it’ll be playable for some PC players today. The paid expansion, titled Survival, was announced at E3 in June with scant details but was delayed over the summer as the game’s developers at Sweden-based Massive diverted development to fix design issues that had marred the Division after launch. That work resulted in a recent patch that drastically improved the game, allowing Massive to focus on Survival. Screenshot from Massive’s Twitch stream of the new Survival mode. The developers say the game’s map has been majorly re-worked to depict the impact of an incoming blizzard. Snow piles up even more on cars and visibility is diminished. Note the lack of a mini-map. Survival is an optional mode for The Division that operates as a sort of elaborate extra mission with distinct gameplay systems and a roughly two-hour limit before the player’s character will die. It’s set on the same map as the main game but with a different scenario. In it, a blizzard is bearing down on New York City and a group of Division agents need to make it to the center of Manhattan to retrieve some key antiviral drugs. The helicopter the agents are on crashes, scattering its inhabitants around the map. What that means in gaming terms is that up to 24 players who matchmake into a Survival session will find themselves starting in spots all around the perimeter of virtual Manhattan, each stripped of their gear, each trying to make it to the center before their character dies. 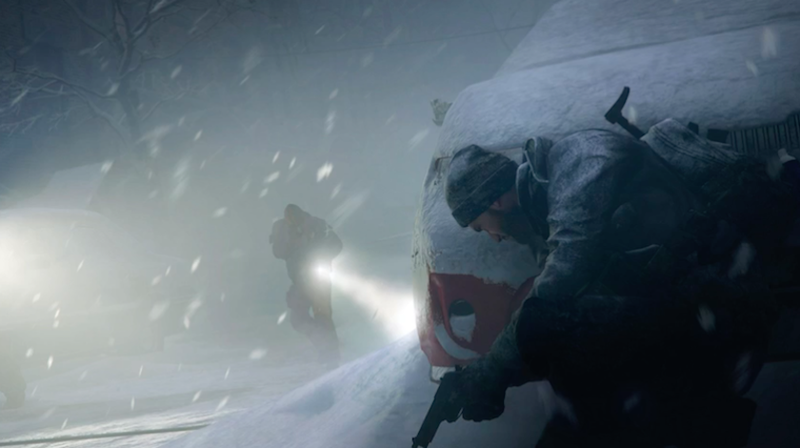 Survival encompasses the full main map of The Division, though re-worked to be full of snow. Each player’s starting gear consists of low-level green items and a pistol. Screenshot from Massive’s Twitch stream of the new Survival mode. Players can use burning barrels for warmth. As described in today’s livestream, players will find that their character is cold, hungry, dehydrated and sick, all of which are systems that need to be managed to survive. Medicine and painkillers slow down the disease (warning: the developers say players eventually develop a resistance to the medicine). Hunger slows health regeneration. Thirst limits vision and awareness. Cold gradually kills the player. You need to scavenge to survive by exploring helicopter crash sites, opening caches and tearing through apartments to find food, gear and clothing. All of the vanity items from the main game—scarves, coats, etc.—now have a cold rating on them and will warm players to different degrees. Players can also hunker down in apartments or stand near fire barrels to warm themselves. Every player’s goal is to get to the center of the map, to the Dark Zone. In there, they’ll find the antiviral drugs they need to extract. They’ll also find tougher enemies, as Survival puts its weakest computer-controlled enemies on the perimeter of Manhattan and deadlier foes toward the middle. Players who manage to extract will receive the best loot for completing the mode. Screenshot from Massive’s Twitch stream of the new Survival mode. Players must keep warm. Formerly useless cosmetic items from the main game now offer cold resistance. But players start with none of this gear and have to find items as they explore and fight to stay alive. Survival overhauls the game’s main map by adding a lot more slow but also tweaks interiors. The developers say they are adding new hideouts, all of which include crafting tables where players can craft their skills. Players don’t start with skills, the developers emphasized. You won’t even have a first-aid healing skill. The new mode also removes the game’s mini-map to make things tougher. Survival can be played by players who have the DLC regardless of character level. They can play in PvP or PvE, with a score bonus if you choose for the more dangerous PvP option. In PvE, players can’t kill each other, but the scarcity of survival supplies may still make that mode feel competitive. There are no rogue mechanics in the game, though the developers say that players will be notified when a player is downed and can decide whether to kill them, save them or take their gear. Death is more of a danger in Survival. Players who are downed can be revived by other players or even self-revive with medkits, but anyone who is downed too long will expire and leave the session. There is no respawning. Players who die part-way through a session will get a score that may earn them rewards to take back to the main game. Those who complete the session and extract will get the best rewards. Screenshot from Massive’s Twitch stream of the new Survival mode. There is no release date for Survival, though the paid expansion is slated for console and PC players. Some will be able to sample it today. The developers said in the stream that those PC players who bought the game’s season pass before last Thursday can play a beta version of Survival starting this afternoon on the game’s public test server. That test version will be available via Uplay but not yet for Steam. The Survival DLC will be rolled out on PC and Xbox One concurrently with a 1.5 patch that adds new weapons, named gear pieces, a new World Tier 5 and raises the gear score. The patch will be free and also come out for PS4, but the game’s marketing deal with Microsoft will slow the release of Survival to PS4 players, who will get it some time after PC and Xbox owners.